The big difference with birth, to my mind, is the length of time you’re ‘fighting’ and the level of sensation; we’re talking hours of active labour, not to mention the preceding contractions to bring you to active labour, not a few matches counted in minutes, all while in a state of increasingly intense discomfort. The long timeline and the pain are not insignificant factors as they require that much more mental toughness, positive self-talk and physical endurance. 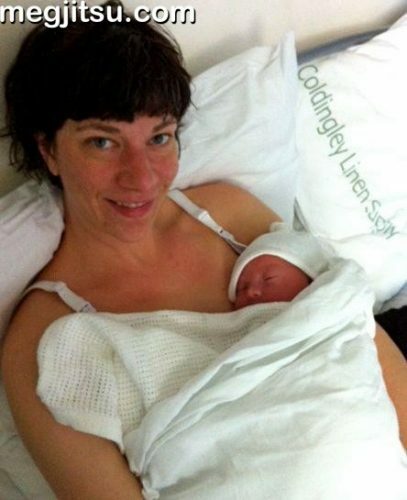 As my pregnancy was ‘normal’ and low risk throughout, I opted for a natural active birth at a standalone midwife led unit called the Barkantine Birth Centre; for my American readers, in the UK midwives handle deliveries in and out of hospital – doctors only get involved for interventions such as C-sections. As soon as I learned I was pregnant, I checked out birthchoice.co.uk to investigate the stats for my local hospitals and so discovered that the Barkantine had, by far, the best stats for outcomes and the lowest rates of interventions; as a person all too familiar with operations, I was very keen to avoid interventions where possible in order to maximise my ability to recover post partum. While it can be a little scary to choose a midwife led unit rather than a hospital with consultants on-call for emergencies, I took the decision early on to be led by the evidence rather than my fears. In my case, this worked out better than I could have hoped. The Barkantine is set up for an active, non-medicalised birth and each birthing room includes a big double bed for the parents, a balcony, an ensuite, a little sofa and tele, as well as a massive birthing pool, birthing ball and birthing stool. The midwives at the Barkantine will work with you to facilitate your natural birth using this equipment and pain relief is available with ‘gas and air’/nitrous oxide and/or opiate injection. For pain relief I progressed from paracetamol, to the birthing pool and finally to gas and air in the pool, but what made the real difference to my ability to cope with the contractions was my training and my physicality. Five hours after my waters broke and the contractions began, I was headed to the Barkantine and the contractions were coming at regular intervals and geting stronger and longer. At this point, it was all getting a bit scary and I started to get nervous and upset on the journey to the birthing centre, but I had such a long way to go! Time to spool up the old training. While breathing into the contractions I would positive self-talk my way up the incline of the contractions, recognise when I was at the crescendo and keep strong until back at the bottom and waiting for the next one. I used this tactic of a strong internal monologue throughout the process and kept up a steady chant of: ‘You’re a warrior, you can do this, fight – fight – fight, don’t stop, the mind always quits before the body, fight – fight – fight’. With the support of the midwives, my husband and the nitrous (love that stuff!) I was able to fight through the heavy fatigue – man it is tiring! – and cope with the pain and after 3 hours managed to dilate from 4 to 10 cm. While the pushing phase, for me, wasn’t particularly painful (I used no pain relief during this portion of the birth and remember my tattoo being more painful than this part of the labour), it was a real test of endurance. As can often happen for first time mothers, my contractions slowed down and weakened as the labour went on; contractions are necessary for pushing so this resulted in a rather long 2.5 hour pushing phase. This part of the birth was even more tiring than the contractions – between each contraction all I could think was how much I’d like to sleep – and it is the fatigue that chips away at the mental toughness and the capacity to endure. Ultimately, the boy was delivered safely and mommy, daddy and baby went home the next evening to enjoy a blissful 2 weeks of paternity leave together. My BJJ training and pregnancy exercise regime directly contributed to my very positive birthing experience. On the one hand, as an amateur athlete (even one that’s been benched with knee rehab and pregnancy for much of the last year) and a martial artist with 14 years of experience under my belts, I’ve regularly experienced pushing my body out of its comfort zone, keeping calm under pressure and getting ‘into the zone’ with what my bod is doing. From pushing myself to run that little bit harder or lift a little bit more when conditioning off the mats, to learning to not be bothered when a 90 kilo dude is crushing me while I make my escape on the mats, as a BJJer I’m pretty familiar with keeping the mind strong so the body can work the technique. On the other hand, as reported in my third trimester round-up, I was working out and ‘pumping iron’ until the day before the birth. Labour is a physically demanding experience and I was on hands and knees for much of the time, either in the pool on on the birthing ball; the good level of fitness I started pregnancy with and the upper body strength I was able to maintain during pregnancy made a big difference to my ability to keep at it; my upper bod was seriously aching the first few days of post-partum recovery! An active natural birth isn’t for everyone and we’re very lucky in the West to have such fantastic facilities for mothers-to-be; giving birth is no longer the life threatening experience it once was and continues to be for many women. From water births and hypnobirthing to epidurals and C-sections, there’s a wide range of choices to suit the circumstances of each individual pregnancy. For me, I was fortunate enough to be in a position to enjoy an active birth and had access to people and facilities to help make that happen; it isn’t for everyone, and nor should it be, but it was right for this pregnancy and I look back on the experience with a lot of happiness and I am convinced that my commitment to exercise during pregnancy and my years of martial arts, especially BJJ, were integral to making the birth what it was. I’m six weeks postpartum, now, and recovering well while juggling the baby and work; we’re a very happy if somewhat tired and disheveled new family. Stay tuned for a report on my early postpartum recovery and the plan rehab the abs and get back to the mats! Congratulations on your beautiful new bundle! And great posts on being active during pregnancy. I was active until the end of both my pregnancies–running, elliptical, hiking, swimming. (i didn’t do bjj then). Congratulations Meg, I’m so happy for you. Love to new baby.